Thousand cankers of walnut is an insect vectored disease that kills black walnut trees. So far the disease has been reported in western states and not in Iowa or other parts of the native range of black walnut. 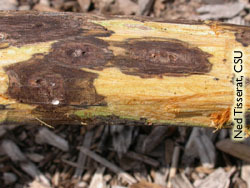 However, like other tree disease and insect pests this one is easily spread by human transport of wood materials. Pass the word along about this emerging disease problem and keep an eye on your walnut trees. For more information please see the ISU Yard & Garden Column. Thousand cankers are caused by Geosmithia sp. fungi. Links to this article are strongly encouraged, and this article may be republished without further permission if published as written and if credit is given to the author, Horticulture and Home Pest News, and Iowa State University Extension and Outreach. If this article is to be used in any other manner, permission from the author is required. This article was originally published on November 11, 2009. The information contained within may not be the most current and accurate depending on when it is accessed.